It may seem counterintuitive, but most real estate agents would list and sell more houses if every so often they stopped working and took a 30 second time out. In football, a 30 second time out is a brief break in the game to allow the players time to catch their breath, assess their situation, review their objectives, and plan what comes next. That’s a great practice for real estate agents, too. 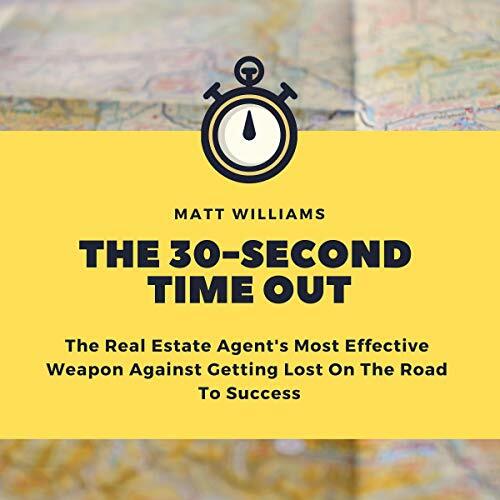 In this concise, informative audiobook, long-time real estate broker, and author, Matt Williams shows how the fundamental nature of the real estate sales profession sets most agents up for failure. Even hard-working and talented agents often fail to realize their potential because they make decisions that are not in-line with their goals. It’s not that agents don’t try to make good decisions. The problem is agents live in a tornado called the real estate sales business. Distractions and chaos often dominate the agent’s time and attention leaving little opportunity for evaluation and planning. By taking a 30 second time out, the agent has an easy and effective way to measure progress, ensure she is doing all she can for her clients, monitor the effectiveness of her systems, and provide a boost to her spirit by showing her what she has to do to reach her goals.